The election of Alexandria Ocasio-Cortez to the US House of Representatives marks a new wave or liberals aimed at shaking things up within the Democratic Party, much like the Tea Party wing of the Republican Party did following the election of Barack Obama 10 years ago. Just as the election of Obama ushered in the Tea Party – financially backed by the Koch Brothers – the election of Donald Trump in 2016 has brought forth the Justice Democrats behind the ideals of Sen. Bernie Sanders, I-Vermont. The goal of this new wing of the Party is to unify the party and root out the old guard that have fell under the wings of corporate money and corruption. Justice Democrats, and those who support them, believe the party no longer represents their constituents. The 2018 Midterm elections saw 26 of the 79 candidates endorsed by Justice Democrats win their perspective primaries, and seven of those candidates went on the win in the general election. Ocasio-Cortez being the youngest and most vocal. The Justice Democrats were founded in January 2017 by Cenk Uygur and Kyle Kulinski and ten others, including many former staffers of the Sander’s campaign. The Justice Democrats require candidates they endorse to refuse contributions from billionaires and corporations. Their main immediate goal is to defeat Trump in 2020 and rebuild the Democratic Party on a national level. Their highest goal is to eliminate special interest money from politics and they desire a constitutional amendment to address that issue. Ocasio-Cortez, 29, will be the youngest woman to serve in Congress. 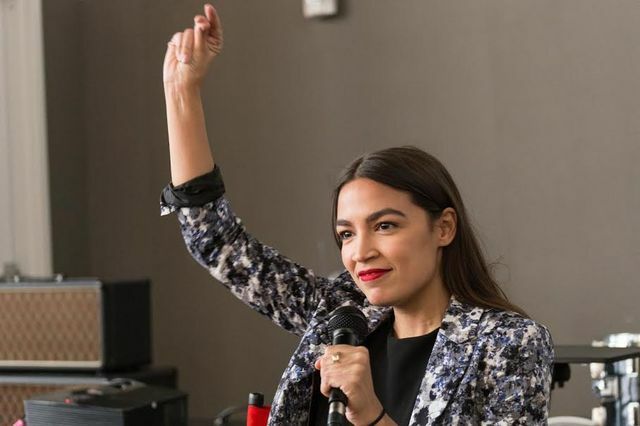 She represents New York’s 14th Congressional District that includes the Bronx and Queens in New York City, and since her election earlier this month she has already began to stir things up in Washington. She has asked activists to help identify Democrats who are “demographically and ideologically out-of-touch with their districts,” and find new candidates to challenge them in future primaries. The new campaign to oust out-of-touch Democrats is dubbed #OurTime and is backed by Ocasio-Cortez and Rep.-elect Rashida Tlaib (D-Mich.). Tlaib is one of the first Muslim women elected to Congress. She represents Michigan’s 13th District that includes Detroit and its suburbs. Ocasio-Cortez and the Justice Democrats believe radical solutions have become a necessity in order to address the many problems facing our nation and our planet. Last week Ocasio-Cortez attended the Sunrise Movement sit-in at the office of Democrat Nancy Pelosi. The group advocates for a select committee to address climate change. This sit-in and her words already suggest she has no plans to keep with the norms of Washington. Ocasio-Cortez and the others don’t care if they anger the old guard Democrats. “Know that they will come after you and that that’s OK because at the end of the day, when you are on the right side of that long arc of history that bends toward justice, we will be able to tell our grandchildren that we fought for what’s right,” she said. The new Congresswoman’s positions include: support of public schools, tuition-free colleges, renewable energy and the end of the use of fossil fuels, single-payer healthcare, abolishing US Immigration and Customs Enforcement (ICE) along with child detention centers. She supports the end of privatized prisons, justice reform and legalization of marijuana, a Constitutional amendment overturning Citizens United and she believes Trump should be held accountable for the Emoluments Clause of the Constitution. She is supportive of the LGBT community and Black Lives Matter and she is critical of the FEMA response in Puerto Rico. She and others from the new wing of the Democratic Party plan to un-apologetically shake things up in Washington. Previous If Mueller’s not closing in, why are so many people ready to pack their bags? Maybe you have a point, but there are many very successful socialist nations: Denmark, Finland, Netherlands, Canada, Sweden, Norway and Ireland to name a few.